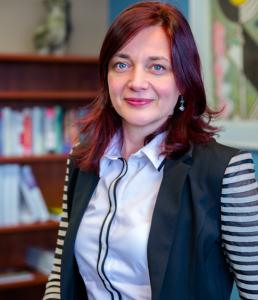 Nela Petkovic joined Laurier in 1995 as a Senior Systems Analyst and has since served in a number of progressively responsible roles, culminating in her 2014 appointment as CIO. In her capacity as CIO she has helped shape ICT at Laurier through the creation and implementation of a 5-year strategic plan for the department, as well as the establishment of a formal ICT governance structure, and the realization and adoption of a university-wide cloud policy. Nela holds a Master of Science in electronic engineering, is a designated Project Management Professional (PMP ®), and has participated in numerous professional development training programs, recently earning the Advanced Executive Certificate in General Management from the Queen’s School of Business Executive Education. She is also a member of the OUAC Advisory Board.